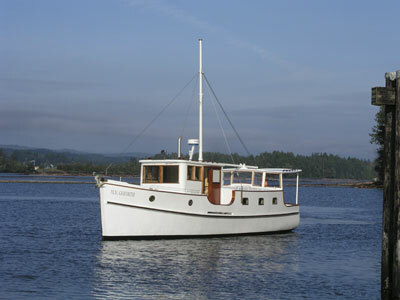 This 35' classic motor vessel was born in the Spring of 1927. Launched at the Balmar & Sons Yard in Newcastle Channel located in Nanaimo, British Columbia, on Canada's Pacific Coast , she was first registered in 1932. The yard is now gone but was located near the site of the present day Nanaimo Shipyard. Originally named the Chiquita II she spent the war years (WW II) under the designation VO81K in her grey wartime livery. Looking for a suitable vessel for their ministry Alf Bayne, one of the founders of the Pacific Coast Childrens Mission, located the Goforth at the Burrard Yacht Club docks at the entrance to Vancouver's Stanley Park. Purchased in 1946, by the then fledgling Mission as their first home and the base for their mission work among the coastal communities, she spent the next 30 years plying the coast bringing the mission to small, remote coastal communities. In his book A Candle on the Coast, Alf gives a detailed look at the B.C. coast during the early years and Goforth's place in its history. MV Goforth is powered by single 4 cylinder GM 4-53 diesel engine with only 40 running hours on it installed in 2002 - parts and service are available coast wide as over 1 million of these engines are in service. Minor finishing is being completed to bring everything to an 'as new' and 'yacht caliber' condition. 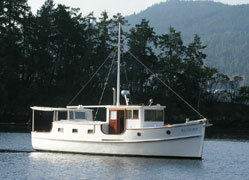 This historic vessel is an able and tested coastal cruiser with a fine pedigree and many miles under her keel. 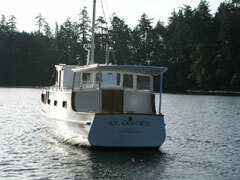 She awaits a new owner to show the many beautiful B.C. coastal cruising areas.